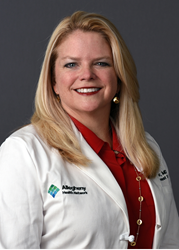 Angela J. Keleher, MD, has joined Allegheny Health Network as Director of the Division of Breast Surgery. Keleher joins AHN from the Dyson Breast Center in Poughkeepsie, NY, where she served as director and oversaw a $4.2 million renovation and expansion project that transformed the program into an innovative, multi-disciplinary and patient-centered care model for patients. At AHN Dr. Keleher will lead a team of experienced breast surgeons and patient navigators who collaborate with radiologists, oncologists, nurses and other medical professionals to treat thousands of patients every year at locations throughout the greater Pittsburgh region. The program offers patients access to the complete spectrum of advanced treatments for breast disease, including immunotherapy, targeted drug therapies and image guided radiation therapy, along with cutting-edge diagnostic techniques and a surgical options to suit every patient. Dr. Keleher joins AHN from the Dyson Breast Center in Poughkeepsie, NY, where she served as director and oversaw a $4.2 million renovation and expansion project that transformed the program into an innovative, multi-disciplinary and patient-centered care model for patients. In her 10 years at Dyson, Dr. Keleher helped establish the Breast Center as a leading comprehensive resource that provides patients with every possible diagnostic and therapeutic option, from biopsy and surgery to leading-edge treatments through clinical trials. Prior to her role at the Dyson Breast Center, Dr. Keleher was Chief of Breast Surgical Oncology at AHN’s West Penn Hospital and assistant professor of surgery at Temple University School of Medicine. “AHN is committed to the kind of multidisciplinary care that I believe is essential to securing the best outcomes for breast cancer patients. In addition, AHN’s partnership with Sidney Kimmel Comprehensive Cancer Center at Johns Hopkins is opening up a new world of clinical trials and collaboration with our fellow clinicians and researchers,” Dr. Keleher said. Dr. Keleher completed her clinical breast fellowship at the University of Texas M.D. Anderson Cancer Center in Houston and her general surgery fellowship at West Penn. She earned her medical degree at the University of Illinois at Chicago, is certified by the American Board of Surgery, and is a member of the American Society of Breast Surgeons and the Society of Surgical Oncology. She has been named one of the “Top Docs of the Hudson Valley” every year since 2011. AHN and Highmark Health are investing more than $200 million in cancer care, including the construction of a new academic cancer center at Allegheny General Hospital, expansion of AHN’s community-based cancer centers located throughout western Pennsylvania, upgrades of the breast center and cancer center at WPH, as well as a new cancer and imaging center at Forbes Hospital. The investment also includes a strengthening of AHN’s relationship with Johns Hopkins, expanded access to clinical trials, recruitment of new oncologists and continued acquisition of new technologies. The AHN Cancer Institute extends world-class expertise to patients through its seven hospitals and more than 50 Cancer Institute clinics across western Pennsylvania, Erie, West Virginia and Ohio. Certified by the American Society of Clinical Oncology’s Quality Oncology Practice Initiative (QOPI), AHN is also the only regional cancer center accredited by the American College of Radiology and the National Accreditation Program for Breast Cancer. AHN hospitals achieved 97 to 98 percent compliance with best practices for cancer care – compared to just 90 percent statewide – as reported by the Commission on Cancer’s Cancer Program Practice Profile Reports. AHN physicians are leaders in the nation’s largest breast cancer clinical trials group, the National Surgical Adjuvant Breast and Bowel Project. The NSABP’s research changed breast cancer practice, establishing that lumpectomies plus radiation are as effective as mastectomies for cancer treatment, that tamoxifen and raloxifene prevent breast cancer in high risk patients and lower the risk of breast cancer recurrence; established hormonal therapy, chemotherapy, biologic therapy, radiation therapy, sentinel node biopsy, and genomic testing as standards of care that have dramatically improved cancer control and quality of life for breast cancer patients. Innovations by AHN clinicians/researchers also include pioneering the use of Stereotactic Body Radiation Therapy (SBRT) as a potential use for all liver cancers; AHN is further developing this technology, which improves cancer control and decreases the toxicity and length of radiation treatments, for patients with breast and other cancers. Allegheny Health Network, a Highmark Health Company, is a western Pennsylvania-based integrated healthcare system that serves patients from across a five state region that includes Pennsylvania, Ohio, West Virginia, Maryland and New York. The Network’s Cancer Institute offers a complete spectrum of oncology care, including access to state-of-the-art technologies and new therapies being explored in clinical cancer trials. The Network’s radiation oncology program is the largest in the country and accredited American College of Radiology. AHN also has a formal affiliation with the Sidney Kimmel Comprehensive Cancer Center at Johns Hopkins, one of the nation’s 41 comprehensive cancer centers designated by the National Cancer Institute, for research, medical education and clinical services. To schedule an appointment with an AHN oncologist, please call 412.DOCTORS or visit http://www.ahn.org/find-a-doctor.